I can't agree more that when the seller says this car is a "Must seeeeeeeeee" because I'm having a hard time justifying the images on the pages with what I know about Volkswagen Beetles. Just how does a Chevrolet V8 fit under the front hood and how does power get to what rear end...it's like I've just seen a picture of a blimp and you tell me its a submarine. 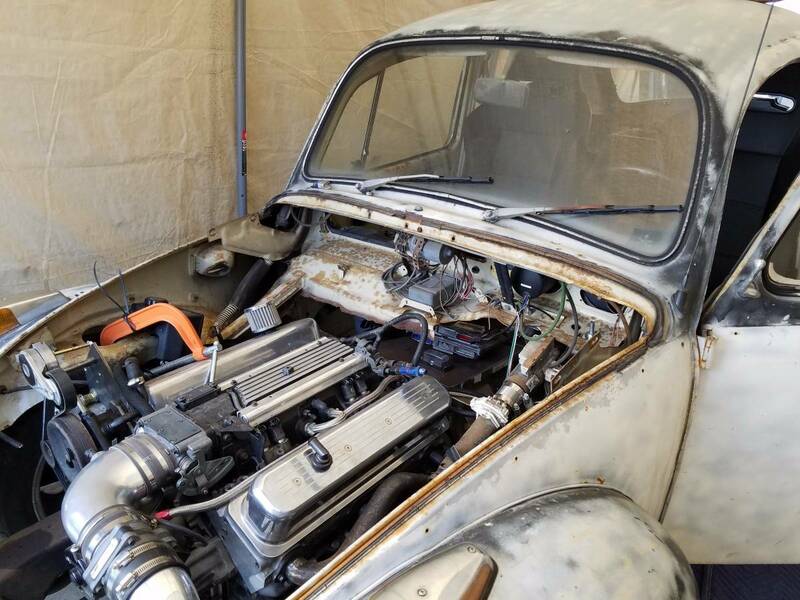 Find this 1971 Volkswagen Beetle V8 offered for an undisclosed price in Thousand Oaks, CA via craigslist. Tip from Sean S.
It looks like a nicely prepared LT1 from a 1995 Vette is sitting in the front of a Volkswagen Beetle, but this isn't like the time you swapped a Chevy 350 into a Mustang or a even a Volvo 240 -- this is a complete make-over of the original people's car design. bug is on a s10 frame with power disk brakes front and rear. tilt steering wheel with power steering. rear end is a subaru sti independent rear diff and and lower controll arms . wheels are off the corvette with new tires . My favorite picture is of the laptop on the front seat. This type of shot is usually someone tuning their mega-squirt system on their 2JZ Supra, trimming the fuel levels and adjusting boost. This laptop looks to be on a baking recipe page. 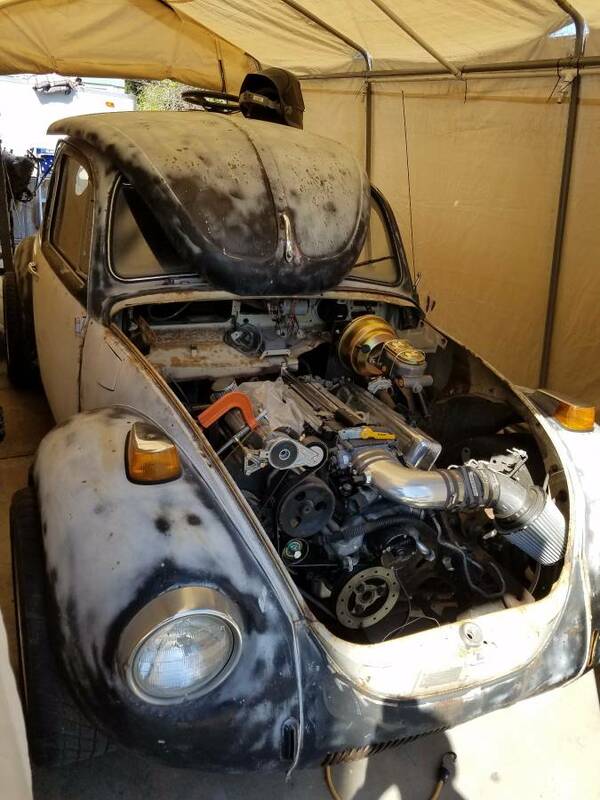 It is quite impressive that the builder got this far before thinking about how to cool the engine. Almost as impressive as using a Subaru rear end, which is an ingenious solution to a problem I can't begin to imagine. I like the c clamp motor mount. I think the C-clamp tells me all I need to know about this project. Guess that's why the hood is off. Better cooling. It can't be all bad... 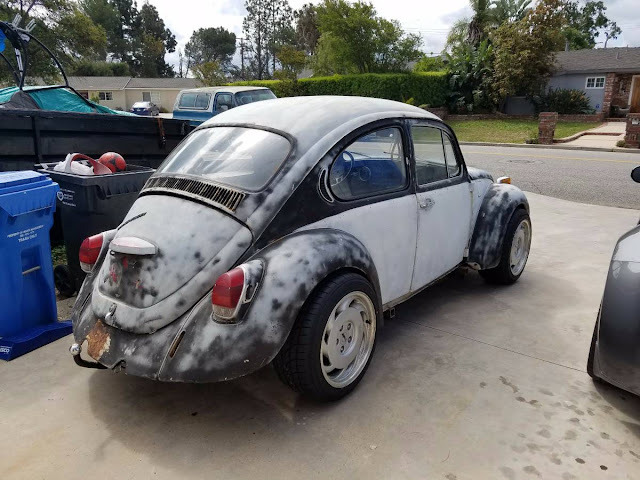 It's comes with a c-clamp and a trailer hitch - everything you ever wanted for your Bug. "What could could possibly go wrong?" Do you think it's OK to drive home to Iowa? big deal about the c clamp probably just needs welded or a bracket made not a deal breaker.this is an engineering masterpiece.i can't think of a more challenging project for a weekend warrior.give the guy some credit.